Allows the user to play and organize various types of media! J. River Media Center 64-bit is complete media solution for extensive libraries. It organize, play, and tag all types of media files and Rip, Burn, serve to Xbox, PS3, UPnP, DLNA, and TiVo. 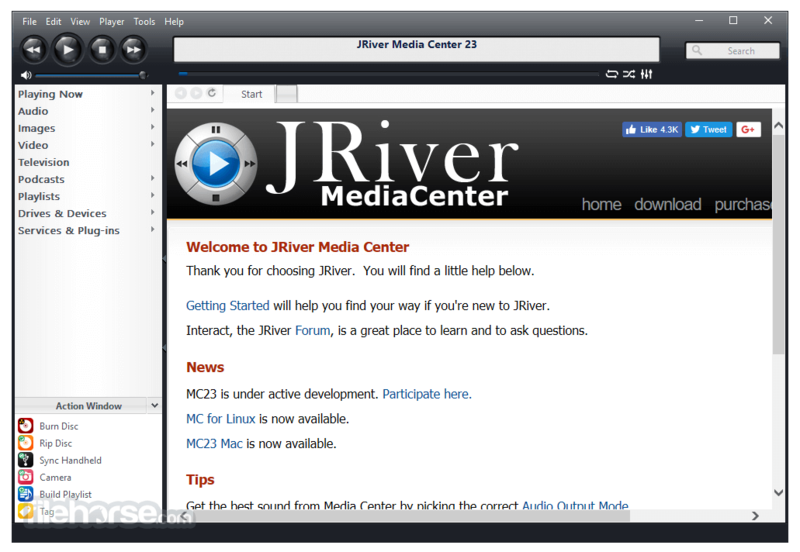 J. River Media Center 64bit features audiophile quality, Ten foot mode, remote control, HD TV recording in real time, customizable media views, supports playe, cameras, 90+ media file formats, integration with Facebook, Flickr, Audible, Amazon MP3, Google, Youtube, Wikipedia, Hulu, Last.FM, and Twitter, cover art lookup, three skinned interfaces, visualization Studio lets you create your own visualizations, DSP Studio allows personalization of the listening environment, smart lists based on rules, drag-and-drop for easy Play list creation, support for CD and DVD database, and support for popular handheld players. JRiver Media Center is the premier audio solution. Whether you demand audiophile quality, or you want fast access to a half million files, no other software will perform like JRiver does. You can start now by downloading the trial version and running it. By default, it will scan your hard disk for media files, but you can also tell it what to import. To rip CD's just put a CD in your drive. Download Now! JRiver Media Center offers the highest quality video available. And it plays everything, without any setup required. MC's Red October DirectShow support is the benchmark of the industry. Video comes in a lot of packages. DVD and Blu-ray, streaming video from Netflix or Hulu, Youtube clips and movies, and so on. JRiver Media Center integrates these into a single seamless interface. JRiver Media Center supports TV tuners from Hauppage, SiliconDust, Ceton, ATI, Aver, and most other manufacturers. You can use the Electronic Program Guide (EPG) to watch live TV or to record or subscribe to your favorite programs. Using Media Center's 10 foot interface, Theater View, you can watch from across the room on your TV and control it with a remote. JRiver Media Center for Desktop can take advantage of your LAN and Internet connections, so you can enjoy your media wherever you are. The set of features that deliver this is called Media Network. 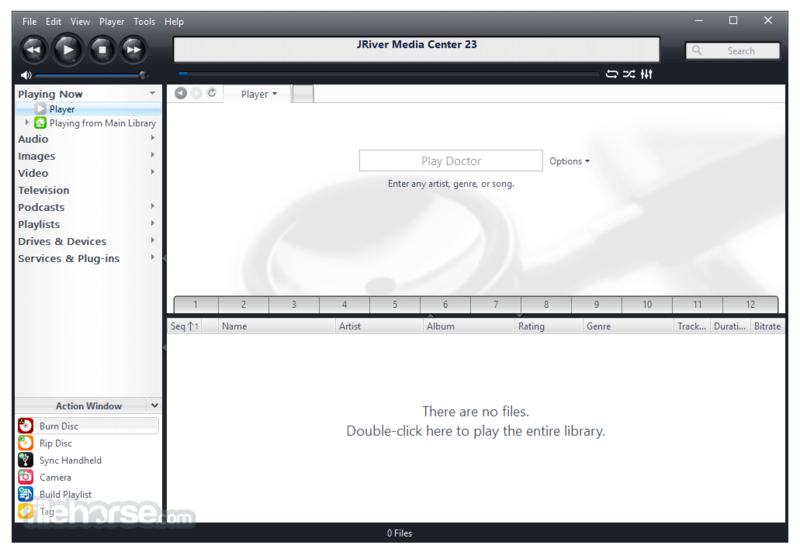 Media Center includes several software servers that can share your media between PC's. You can rip and organize on one machine, and play on many others. You can use MC's zones to serve media to several clients, even playing different media at the same time. Media Center will work with thousands of TV's, Blu-ray players, receivers, and other devices which support the DLNA protocol. You can also use a PS3 or an Xbox 360. Remote control is easy. Media Center supports any remote with a Green Button, and most other remotes can be programmed to work. JRiver sells a Media Center Remote that is certain to work straight out of the box. 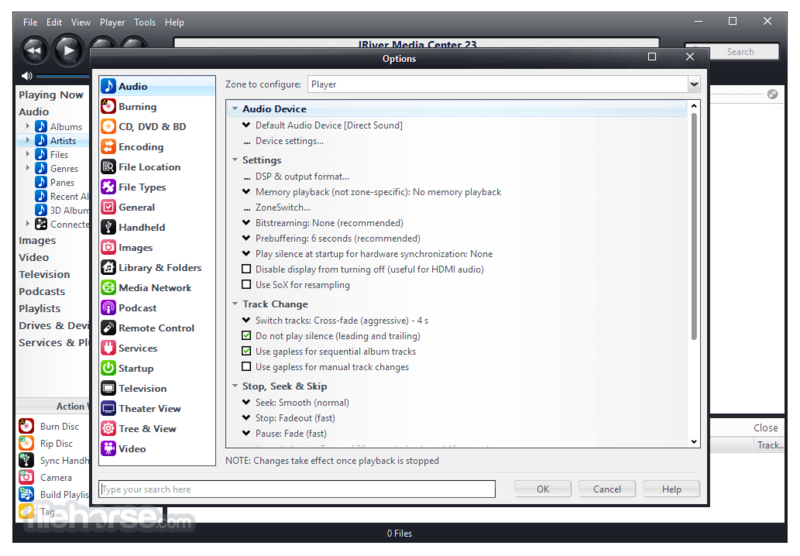 Media Center can automatically convert audio and video streams for client playback when your connection isn't fast enough to play unconverted media. Setup is simple. Just use Media Center on your server to generate a six character access key. Then enter that key on any client you want to use. A test mode can use JRiver's servers to test whether access from outside your network will work. 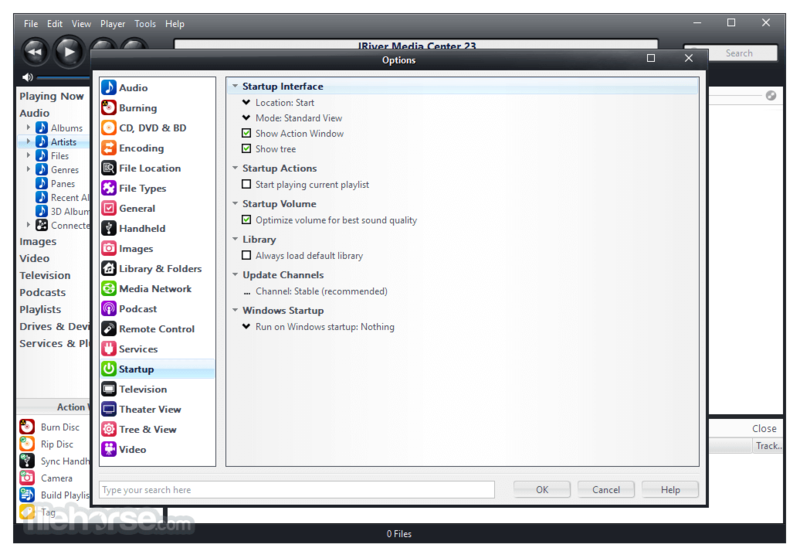 A Home Theater PC is a computer that is connected to a television, a projector, or an audio video receiver for the purpose of watching video or television from across the room. Think Couch Potato. This requires what is called a "ten foot" interface or GUI so that the person on the other side of the room can read it well enough to control it. Media Center's ten foot view is called Theater View. A remote is usually used so that the viewer can remain on the couch. JRiver supports several kinds. Media Center has a ten foot interface called Theater View. It's drawn with 3D graphics so it has a nice elastic feel. It's also configurable, so you can remove portions you don't use, or move things around to suit your taste. Background graphics give it additional appeal. Theater View is touch screen friendly. 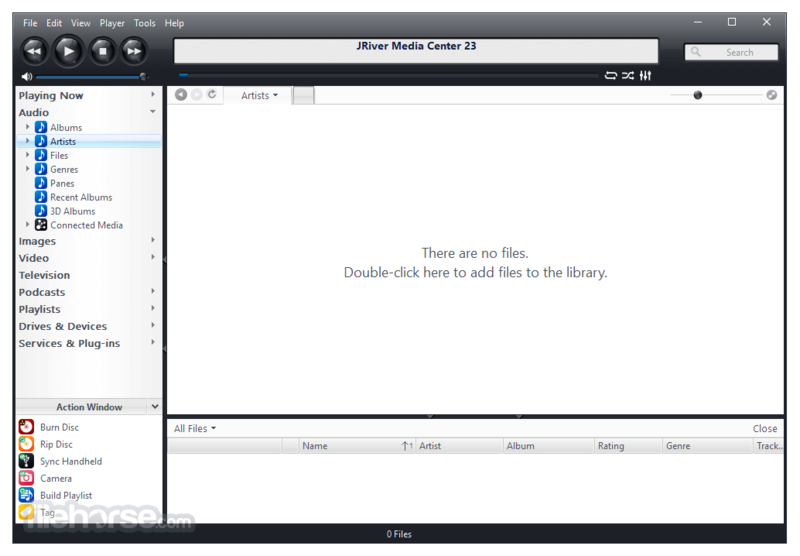 J. River Media Center for Windows PC is a powerful way to store and view your photos. Plug a camera in, wait a few seconds for Windows to find it, and click Acquire in the Action Window. Files are copied to a temp folder, where you can delete, rotate, and tag them. Then use MC's Rename, Move, and Copy tool to move the files to directories according to date or other tag information. Edit files with a right click. Crop, adjust, resize, and other common tools are available. Editing automatically stacks the originals and each saved version, so you can easily undo or start over. The original remains unchanged.